Discussion in 'Contribute' started by dotequals, Feb 19, 2018. 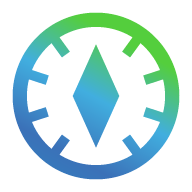 FreeSO Dashboard is a website you can use to check how many sims are online, how many sims are in each lot, what time it is in game, and more! It's convenient to use, whether you're just trying to find where the party is or you want to check up on your lot without having to log in. Individual lot pages now show their established date, admit mode, category, skills enabled mode, and description! Lead code in your browser and have your teammates see everything in real-time. Navigate to "More" and then "CBU Chat". Track jobs and UTC time for events. Navigate to "More" and then "Job Clock". 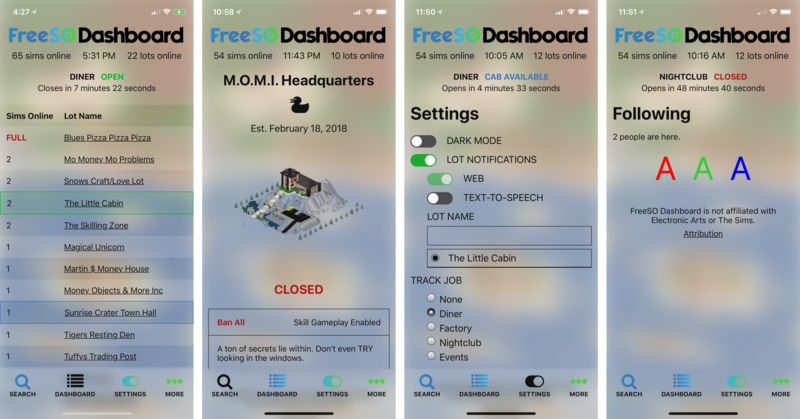 If you like how these screenshots look, just add FreeSO Dashboard to your home screen on iOS or Android and you'll be able to navigate without your browser's UI getting in the way. 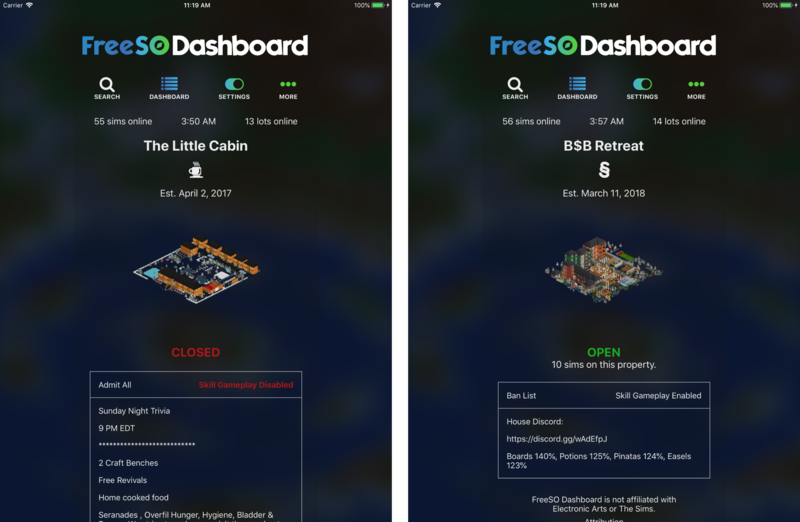 As the FreeSO API is built out to include richer information on lots, the dashboard will be updated to consume that info. If you have FreeSO Dashboard bookmarked as a different URL, you should update your bookmark as the previous one is only working due to your browser cache. If you have installed FreeSO Dashboard as an app on your Android device and it launches to a blank screen, you should reinstall the web app as it has been updated to fix this bug. The website heavily caches itself to your device. If you aren't seeing changes, refresh the page and they will likely be there. The Architect, NubSmoo, Alessandro Needs A Server and 4 others like this. You can now track when all jobs lots are open or closed. You can track UTC time as it's most often used for in-game events. You can "subscribe" to one job or UTC time so that it shows up on every view of the Dashboard. You can lead or follow a round of code in real-time. TTS has been broken for 24 days, but your devices will start speaking again! And as always, if you aren't seeing the updates, just refresh the page after a few seconds and they'll be there and for list of changes check the changelog. JWofles, RHY3756547 and mrpenguinb like this. This is so cool thanks for creating this, said samsung browser to save it on the launcher as a link and it actually feels like an app. So cool. Thanks! Thank you! I'm glad someone else has added it as a web app to their phone! It's a great experience without the UI of the browser being shown and Android is really great about making Progressive Web Apps (PWAs) first-class citizens. JWofles, AquilaSim, RHY3756547 and 1 other person like this.